When I wrote about Max Muncy, I pointed out how strange a season it’s been for the Dodgers. Many of the best players have been hurt, or they’ve underperformed. Meanwhile, they’ve been supported by surprises like Muncy, Ross Stripling, and Matt Kemp. Muncy has been one of the team’s better hitters. Stripling has been the team’s most valuable pitcher. And Kemp has been the team’s most valuable overall player. I mean that in terms of WAR — Kemp has the highest figure on the club. At +1.8, he’s already done more than he did in any of the previous three years. I skipped right by that when I was writing about Muncy, because I was writing about Muncy. But it’s just as big a deal. Remember, nobody wanted Kemp. Even the Dodgers didn’t want Kemp. It appeared he’d declined into being a valueless player. When he was traded, he wasn’t traded because of his skills; he was traded because of his contract. Now we’re more than two months into 2018, and Kemp’s a major reason why the Dodgers are even alive. His present WAR alone might be the most astonishing early statistic. I want to drill a little deeper. Kemp’s WAR is surprising. One component of his WAR is even more surprising. Matt Kemp has been a tremendously productive hitter. With a wRC+ of 160, he looks like the guy he was in his prime. Kemp hitting well doesn’t come out of nowhere, however. Through this point just last season, Kemp’s wRC+ was 145. When he’s been healthy, and when he’s been focused, Kemp has remained dangerous. There aren’t many pitchers he isn’t capable of hurting. But while Kemp has swung a good bat for much of his entire career, he’s also been a case study in why WAR is so significant. Used to be, you’d look at Kemp’s offense, and you’d figure, welp, he must be pretty solid. Yet in truth, in other areas, Kemp has given value away. He hasn’t been a good baserunner in a very long time. Far more important than that, he hasn’t been a good defender in a very long time. Anyone who’s read FanGraphs for any number of years knows that Kemp established himself as a major defensive liability. For that reason, this past offseason, Kemp was looked at as a glorified DH. That’s why there wasn’t a market for his services. But as I’m writing this, Kemp has a Defensive Runs Saved mark of 0, as a corner outfielder. Looking at Ultimate Zone Rating, he’s at 0.1. 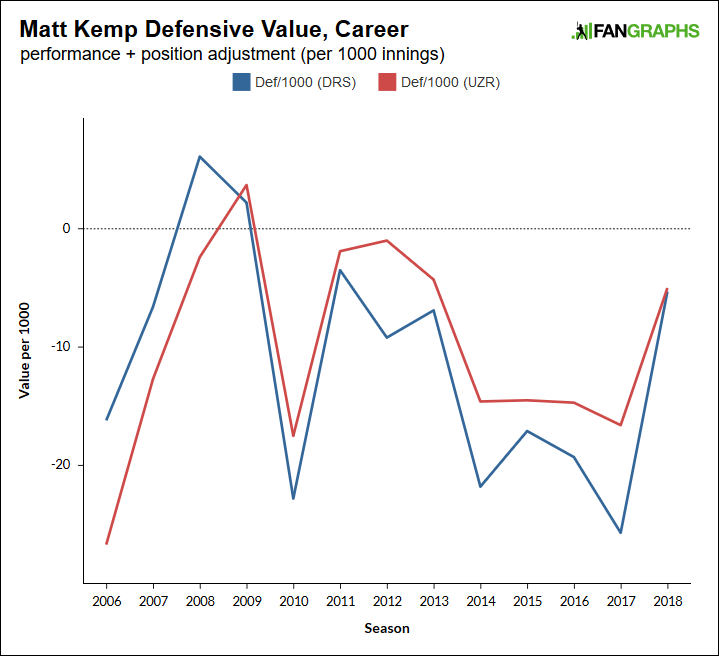 Let’s fold in the positional adjustment and examine Kemp’s entire big-league career, viewing his defensive values per 1,000 innings. That puts everything over a common denominator. Matt Kemp is almost 34 years old. He has a fairly long track record of injuries. Between 2014 – 2017, Kemp was one of baseball’s very least valuable defenders. Now, a third of the way through the year, Kemp’s turned the clock back a half-decade. Kemp hasn’t been a liability by these numbers, and there are more numbers we can throw onto the pile. According to Statcast’s Outs Above Average metric, in 2016, Kemp finished in last place, at -23. In 2017, he again finished in last place, at -18. In 2018, he’s at 0. That’s 0 outs above average, which is the same thing as 0 outs below average. When you look at Kemp in the leaderboard, you find him right next to guys like Jason Heyward and Jarrod Dyson. This is our incredible early reality. There are a lot of astonishing early numbers. Don’t get me wrong, you could make an argument for several of them. Nothing astonishes me, personally, more than this. More than Matt Kemp being an adequate defensive outfielder. I know we don’t usually celebrate basic adequacy, but given where Kemp has been in the recent past, this counts as something major. How might one explain what Kemp has accomplished? It matters, of course, that so far in 2018, Kemp has been healthy. Just last year, he had problems with both of his legs, and it’s no surprise that could take a toll. But you might also remember that, in spring training, Kemp reported to camp down something like 40 pounds. Ordinarily, we dismiss those stories. Players are supposed to show up in great shape. But we can revisit something Mike Petriello wrote about in April. At least as far as sprint speed is concerned, Kemp has gotten faster. He’s gotten faster by 1.4 feet per second. Compared to last year, that’s the third-greatest increase in baseball. Since 2015, it would be the fourth-greatest year-to-year increase on record. No, sprint speed doesn’t capture everything about running, but one’s top speed is important. Kemp seems to be moving better, which would follow from putting a lesser burden on his legs. As far as Kemp’s positioning is concerned, I don’t see a major difference. I don’t think that’s the explanation. Part of this might be that Kemp has faced easier opportunities. In 2016, Kemp’s expected catch rate ranked in the 30th percentile. The next year, the 45th percentile. This year, the 96th percentile. Kemp hasn’t yet been challenged like he was before, and that could be helping him out. At the same time, the advanced defensive metrics are built to fold that in. All things considered, he’s been better than before. Rest could help us out further, here. As we try to understand why Kemp is where he is, we can look at how the Dodgers have used him. In 2015, Kemp finished 87% of the games he started. In 2016, he finished 78%. In 2017, he finished 71%. In 2018, he’s finished 49%. This is probably a reflection of two different things. One, the Dodgers don’t think Kemp is a defensive plus. But two, the Dodgers are trying to preserve his health. The less often Kemp has to run around, the less likely he is to wear down. One can learn only so much from a few carefully selected defensive videos, but here are four — two missed plays from 2017, and two fairly similar made plays from 2018. The present-day Kemp does appear more willing to take a chance, and that could just be the product of confidence. As Kemp moves around and feels more athletic, he might be more willing to put that athleticism to greater use. But I don’t think the Dodgers much care that Kemp’s defense isn’t elite. Kemp’s defense was never elite. It’s important enough that he’s been about average, because average defense, with that bat, makes for a valuable player. A valuable player who, a few months ago, the Dodgers were trying to dump. They didn’t expect to end up in this position, but, wouldn’t you know it; early Matt Kemp has helped the 2018 Dodgers weather a terrible storm. Because of Kemp’s history, he’s a higher-than-average risk to get injured. And as Petriello wrote in April, historically, Kemp has been at his fastest in the early parts of the season. He might end up hurt, or he might end up fatigued. Older players don’t often get the luxury of playing at 100%. But remember that this is a slimmed-down Kemp, and a motivated Kemp, a Kemp eager to make a better impression on a competitive club. And even if things go sideways in the near-term future, Kemp has kind of already done enough to further the Dodgers’ cause. He’s already been more than the team expected him to be. This is one time when the front office doesn’t deserve too much credit. Back before spring training, the Dodgers didn’t want Matt Kemp. Through two months and change, the Dodgers have needed him. We hoped you liked reading The Most Astonishing Early Statistic by Jeff Sullivan! Kemp looks like Billy Hamilton running the bases compared to Miggy. Oof marone he looks terrible.